There has been a flurry of discussion around process in OWS of late. This can only be a good thing. Atrophy and complacency are the death of movements. Any viable experiment in freedom is pretty much going to have to constantly re-examine itself, see what's working and what isn't—partly because situations keep changing, partly because we're trying to invent a culture of democracy in a society where almost no one really has any experience in democratic decision-making, and most have been told for most of their lives that it would be impossible, and partly just because it's all an experiment, and it's in the nature of experiments that sometimes they don't work. A lot of this debate has centered around the role of consensus. This is healthy too, because there seem to be a lot of misconceptions floating around about what consensus is and is supposed to be about. Some of these misconceptions are so basic, though, I must admit I find them a bit startling. Just one telling example. Justine Tunney recently wrote a piece called "Occupiers: Stop Using Consensus!" that begins by describing it as "the idea that a group must strictly adhere to a protocol where all decisions are unanimous"—and then goes on to claim that OWS used such a process, with disastrous results. This is bizarre. OWS never used absolute consensus. On the very first meeting on August 2, 2011 we established we'd use a form of modified consensus with a fallback to a two-thirds vote. Anyway, the description is wrong even if we had been using absolute consensus (an approach nowadays rarely used in groups of over 20 or 30 people), since consensus is not a system of unanimous voting, it's a system where any participant has the right to veto a proposal which they consider either to violate some fundamental principle, or which they object to so fundamentally that proceeding would cause them to quit the group. If we can have people who have been involved with OWS from the very beginning who still don't know that much, but think consensus is some kind of "strict" unanimous voting system, we've got a major problem. How could anyone have worked with OWS that long and still remained apparently completely unaware of the basic principles under which we were supposed to be operating? Granted, this seems to be an extreme case. But it reflects a more general confusion. And it exists on both sides of the argument: both some of the consensus' greatest supporters, and its greatest detractors, seem to think "consensus" is a formal set of rules, analogous to Roberts' Rules of Order, which must be strictly observed, or thrown away. This certainly was not what people who first developed formal process thought that they were doing! They saw consensus as a set of principles, a commitment to making decisions in a spirit of problem-solving, mutual respect, and above all, a refusal of coercion. It was an attempt to create processes that could work in a truly free society. None of them, even the most legalistic, were so presumptuous to claim those were the only procedures that could ever work in a free society. That would have been ridiculous. Thursday, the House of Representatives will vote on their version of the Violence Against Women Act, which excludes protections for Native American women. Native women are more likely to be victims of violence than any other ethnic group in the United States. This is unacceptable. We will be marching and round dancing in front of the House of Representatives to demand justice and safety for our sisters. 10AM on Thursday February 28, 2013, starting at the Capitol South metro station. Please join us. Please use #VAWA #1BillionRising #SaveWiyabiProject for twitter hashtag support and spread the word! Since their first issue in December 2011, Tidal has made it their practice to give name to our struggle, wrestling with the big ideas that propel us into the streets, with what we should do when we get there, and with where there in fact is. This Friday, the folks at Occupy Theory will release their fourth issue of the magazine, featuring original pieces by organizers of Occupy Wall Street, Occupy Sandy, Strike Debt and Free University. Join them that night for conversation as we move together towards the empowerment that greater clarity and the free exchange of ideas can bring. Jenna Pope documented last Sunday’s Forward on Climate Rally. Beautiful sights--the vistas of activists in D.C. to make their voices heard about climate change--beautifully captured. Les Leopold of the Huffington Post explains why “the raison d’etre for Occupy Wall Street is proving correct. Much of high finance is based on a ‘corrupt business plan.’” Proof of Wall Street’s corruption continues to mount, with ratings agencies on the take, money laundered for drug cartels, and rampant insider trading, among many other ethical and moral malignancies. On the OWS Direct Action Blog, Mark Adams gives us the push we need to meet, to talk, to plan for spring. Revisit Liberty Plaza in full swing in Why We Occupy, an open-source book of interviews gathered in the park in 2011. See the park grow and change in real-time through the heartfelt words of the participants. A panel discussion focusing on the inter-connectivity of global protest movements from Cairo to New York featuring acclaimed Director Jehane Noujaim (Control Room; Rafea; Solar Mama) and award-winning Producer Karim Amer. Join New York Civil Liberties Union Occupy Wall Street (OWS) Coordinator Katherine Bromberg. Extended clips from the 2013 Sundance Award-winning film, THE SQUARE, will be shown throughout the event. Living Theater, 21 Clinton Street, NY, NY This is a special Occupy the Pipeline Benefit Cabaret featuring: magicians, performance artists, belly dancers, burlesque, two bands and the cheapest bar in downtown Manhattan. This evening of entertainment will benefit the activist/performers and sustain upcoming Occupy the Pipeline actions as we continue our fight against fracking in our beloved city and state! Tidal 4 is being released this Friday evening. Come and pick up your own free copy! The assembly of the 15M Archive and friends in Madrid will be joining us at Bluestockings via Skype, moderated in New York by 15M and OWS activist Juan Escourido. We’ll talk about the history of the 15M Movement, the organization of its archive, and the politics shared by 15M and other social movements, including OWS. In Madrid, participants will gather at the occupied social center Patio Maravillas, coordinated by Vlad Teichberg and Nikky Schiller, communications activists for both the OWS and 29S movements. Join Occu-Evolve’s latest assembly commemorating Black History Month, discussing the significance and insight of Malcolm X to our struggles around a variety of issues that People of Color, Women, the Working Class, Poor People and all of the 99% face today. This event will be followed up on Sunday, February 24th, 4:00pm with an Occupy-Evolve Day of Gratitude for its One Year Anniversary. Greg Smith, former Vice President at Goldman Sachs and author of “Why I Left Goldman Sachs”, will discuss how banks behave behind the scenes and how those practices differ from the perception they convey to the public. To build on last year’s powerful solidarity, 99 Pickets and Immigrant Worker Justice are calling a community-wide May Day planning meeting on Feb. 28. Let's create an open and inclusive space where we can coordinate planning and build momentum for an incredible May 1, 2013. NYCGA.net event page is here. Data mining and visualization for the 99%. At the event, we’d like to focus on a few new data sets/projects. Occupy Sandy and Aaron Swartz’s work has come up, and generated a lot of interest. Any ideas, data resources you may know of or questions, please let us know: Occupy Data listserve or info@occupydata.nyc. Join the Occupy Your Workplace group for a discussion of strategy and tactics of workplace organizing. We'll have several folks present who have experience as workplace "salts" - workers who get jobs with the aim of organizing. Workers who are curious about organizing, experienced organizers and activists, union members, and all other workers and non workers welcome. RSVP for the event on Facebook. SDS/Occupy Colleges is hosting a National Day of Action against Tuition and Fee Hikes. Join to get updates on flyers, coordination calls and other distribution materials. Message Occupy Colleges and we will help promote your campus/ organizations demonstration. Join hundreds of leaders, organizers, techies and activists to share our wisdom, skills, and talents. We will have workshops, discussions, consulting and networking opportunities, visionary speakers and a provocative debate around strategy and practices. Over three days right by Wall Street, we will bring together a thousand people to learn from each other, share stories and strategies and build our skills, organizations and movements. This is an event that occupy organizers will be participating in to build and share their skills. It will assuredly build upon the success of last year’s OWS unconference that was held in collaboration with Organizing 2.0. Editor's note: This article was submitted to us in response to Occupiers! Stop Using Consensus! and is part of the series To Consense or Not To Consense? Consensus is a group process by which people determine their own ideas and actions. It is the most democratic of all forms of decision-making for it negotiates conflict without the use of force. As long as there have been people talking to one another there has been consensus. In what is now known as the United States, the earliest documented consensus process was by the Haudenosaunee in the 12th century. By the 16th century a league formed of the Mohawk, Oneida, Onondaga, Cayuga, and Seneca nations. This is often cited as the Iroquois League or Confederacy. They used a council system with elders, who acted as delegates or “spokes” of the different nations and came to consensus on matters concerning the Great Lakes region. In times of war elder women had the ability to veto over the other elders. Meanwhile, in Europe, the Anabaptists were mounting opposition to the hierarchy of the Roman Catholic Church. By the 16th century there were many heretical sects the most prominent of which were the Quakers, who became known for their “rule of sitting down.” Rather than rely on priests or ministers they would sit in circles and listen to one another. It was thru this practice that they achieved divine revelation. Modern American Quakers claim to be inspired by both by the Iroquois and their own history of the Anabaptists. Throughout the 19th 20th century Quakers played an important role in U.S. social movements from abolition to women’s rights to every anti-war movement. In the early 1960s Quakers acted in solidarity with the civil rights movement and trained many of its early members in consensus including the founders of SNCC (Student Non-Violent Coordinating Committee), which emerged out of the youth division of the NAACP. SNCC went on and organized the freedom rides and lunch counter sit-ins using consensus. The women’s liberation movement took inspiration from the Quakers in response to the top-down and patriarchal structures of the anti-war movement and adopted a consensus process. Consciousness-raising groups, modeled after the Quaker “listening” circles, were central to feminist practice. At the same time the Quaker Action Group gave birth to a national network called Movement for a New Society (MNS), which fostered both intentional communities and non-violent organizing campaigns. The group struggled to keep a balance in their work, and many became involved in the anti-nuclear movement. The Clamshell Alliance was the largest group of the anti-nuke network and coordinated decentralized shutdowns of various nuclear power plants throughout the 70s and 80s. The most infamous was the Seabrook Nuclear Power Plant shutdown of 1977 in which 2,000 people organized in affinity groups and blockaded the construction site. The network used a formal consensus process and affinity group spokes councils to plan their actions. In the late 80s and into the 90s an offshoot of the Clamshell Alliance formed Food Not Bombs, a viral network of cooking collectives, which also operated by consensus. The aim was to live off the waste of the capitalist system and enable people to feed themselves. This became a staple of anarchist communities throughout the U.S.
By 1999 the alter-globalization movement was beginning to take shape. In the U.S. a network of mostly young anarchists created the Direct Action Network (DAN) to shutdown the World Trade Organization (WTO) in Seattle. 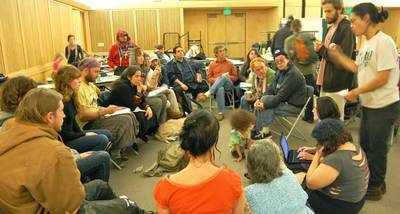 During the months leading up to the convergence activists were trained in consensus and formed affinity groups, which then descended on Seattle in a pie-like formation blocking access to the convention sites. They successfully shut it down, which sparked a wave of similar actions under the banner of the Continental Direct Action Network (CDAN). These were all coordinated via affinity group spokes councils in the style of the anti-nuke movement. Unfortunately, internal divisions in CDAN, 9/11, and the following anti-war movement tore the network apart. Since this collapse many vestiges have remained including an archipelago of bookstores, Info shops, Independent Media Centers, Food not Bombs chapters, and housing collectives. These institutions carried the culture of consensus and served the basis for the anti-authoritarian movement before Occupy Wall Street. On August 2nd, 2011 New Yorkers Against Budget Cuts (NYABC), the group that had organized Bloombergville, called a People’s General Assembly at the bull to coincide with the debt ceiling debate and organize around the Adbusters call to “Occupy Wall Street.” At this convergence, NYABC, which was comprised of the authoritarian left including groups such as the ISO (International Socialist Organization) and Workers World, held a rally with speakers, so a group of anarchists and other anti-authoritarians broke off and formed an assembly. It became known as the New York City General Assembly. For weeks people met in Tompkins Square Park and planned to “Occupy Wall Street” on September 17th. These meetings used a modified consensus process. We reached consensus on many points including a tactical plan for the day of action. After many weeks we grew to know one another thru face-face communication. We established a common set of principles including horizontality, participation, and autonomy. The intention was clear and the group was small enough that we were able to communicate effectively. On September 17th the action was the process. Upon arriving at the park we had hundreds of people in small groups talking with one another about the economic crisis. As the night went on the small groups formed one massive assembly of hundreds upon hundreds of people that consented to occupy. Thus began the occupation. Now, not everyone in the assembly actually occupied. There were roughly 50-100 people that stayed and held down the park in the first few weeks. We used consensus, because we had used it in the planning process, but it was also re-affirmed by additional people staying in the park. We drafted the Principles of Solidarity and the Declaration using consensus and set off a wave of other occupations that also used the process. As the weeks went on the original members did not find the assembly useful anymore. It was overrun by opportunists and tourists, who did not understand the meaning or context of the process. They modeled the hand signals, but reduced the assembly to a set of procedures. In a body of strangers there was no respect for one another. Starhawk writes, “Consensus works best in a group that cultivates respect, where people care not only what gets done but how we treat one another in the process. Consensus asks us to put aside our egos, our need to win and to be right and open our ears to listen, to appreciate the contributions of others and to co-create solutions to our problems.”This was sorely lacking in the assembly and later on in the OWS Operations Spokes Council. We fought over proposals, ¾ of which were about money. It became a competition rather than a collaboration. In researching for this article I decided to focus on the American context, but I also found that in nearly every instance of consensus, regardless of cultural context, and over the course of a thousand years, there are two main problems: size and membership. Whether a Chinese village, Mayan jungle, or the streets of New York City these seem to be common threads, and they are always addressed by some sort of confederation or federation of small groups. These may be assemblies, working groups, or affinity groups. The terms change but the form has been essentially the same throughout history. How can we build a culture of consensus in Occupy Wall Street? This is the question that we face now. I hope that we engage it. 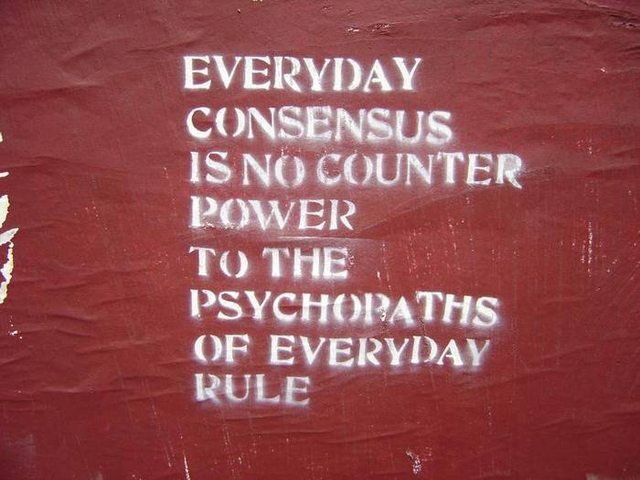 Related: To Consense or Not-to-Consense Occupiers: Stop Using Consensus! Consensus process (the idea that a group must strictly adhere to a protocol where all decisions are unanimous) is the absolute worst idea that has ever been introduced to the activist community. Consensus process is the tyranny of the individual. It is the most anti-social of all processes because it allows any one person to assert irrational authority over an entire group of people and block any sort of decision making. It has nothing do with anarchism (even the IWW doesn't use consensus!) because it was invented by Quakers for religious reasons. It's stood in the way of progress, destroyed social movements, destroyed groups, destroyed communities, and relegated radicals to the fringes of American politics since the 70's when it was first popularized. Consensus process is in many ways an attempt to formalize the act of resistance, which I suspect is what makes it so popular in activist communities. Let's compare this to democracy, a system which was invented to formalize dissent. With democracy, you could fight and disagree without resorting to violence. Feathers could be ruffled, progress could be made, and life moved on according to plan. Resistance on the other hand is when you're so angry at something, that you're willing to go on a crusade and use all available means to stop that thing from happening Resistance knows no rules. It is something that should never happen, yet is the responsibility of any socially conscious individual. It's a wild beast which cannot be tamed. Now ask yourself what happens when you get a bunch of people in one room, people whose nature inclines them towards resistance, and then give them the power to resist with a simple hand gesture and a requirement that all others be subservient to their demand. You do the math. To give an example, the first time I saw a block used at Occupy was at one of the first general assemblies in August 2011. There were about a hundred people that day and in the middle of the meeting a proposal was made to join Verizon workers on the picket line as a gesture of solidarity in the hope that they might also support us in return. People loved the idea and there was quite a bit of positive energy until one woman in the crowd, busy tweeting on her phone, casually raised her hand and said, "I block that". The moderator, quite flabbergasted asked why she blocked and she explained that showing solidarity with workers would alienate the phantasm of our right-wing supporters. Discussion then abruptly ended and the meeting went on. The truth was irrelevant, popular opinion didn't matter, and solidarity—the most important of all leftist values—was thrown to the wind based on the whims of just one individual. Occupy had to find a new way to do outreach. But as bad as that sounded, it was actually one of the most graceful instances I've seen of a block being used. This is because the proposal was actually dropped as though it never happened. Things don't always go so smoothly. Blocks have a tendency to bring out the worst in people. The thing they don't tell you about consensus, is that it only works if you're willing to exclude others from it. When faced with a block, it's common for people to use psychological manipulation, threats, invent process to deny that person a vote, or even pressure them to leave the group entirely. Oftentimes when such people don't get their way, they'll leave the group themselves. Consensus invites the most awful type of conflict because there can be no agreeing to disagree. But at the same time consensus also quells the more constructive forms of dissent because most considerate and rational people aren't masochistic enough to welcome the hatred and backlash inherent in blocking a proposal. Consensus process can also be hacked. This is because it leaves too much to interpretation, doesn't actually specify procedure, and doesn't make sense! Take for instance kicking someone out of your group. Do you need consensus to kick them out? Or do you need consensus to keep them on board? Oftentimes such things aren't clear, so the system becomes ripe for manipulation and exploitation. If you ever want to be evil and push a proposal through a consensus body, just make a compelling argument that you need consensus to not pass your proposal (rather than the other way around). If that doesn't work, try writing your proposal with the opposite language and blocking it yourself. If people call you out on your shenanigans, just accuse them of being authoritarians who refuse to follow process and demand that they either step down or reach consensus on creating a rule to forbid what you’re doing. Then block that proposal too. If they tell you that you’re not allowed to block then you can always complain that true consensus cannot be reached until there’s a quorum of every single group member present. Grassroots activist groups also follow the spirit of consensus regardless of what process they use. This is because participation in occupy assemblies, working groups, and affinity groups is entirely voluntary. Generally speaking, these groups do not control any land or resources upon which their members depend, therefore making it nearly impossible to practice any real coercion. When freedom of association exists in the truest sense of the words, the act of participation in and of itself can be considered itself a form of a consent, even if decision-making power rests in the hands of the majority or an individual leader. Consensus should be reserved to teams (small groups where people work well together and trust one another) as de facto rather than official process. Many of us operate by implicit consensus without even realizing it. It’s a natural human behavior to not want to piss off and ignore other members of your team. But when the occasional irresolvable conflict arises, a majority vote isn’t the end of the world. It’s called democracy. If those conflicts happen too often, then perhaps it’s time to reconsider why you’re working with such people. When it comes to deliberative process for larger groups that can’t be considered teams, start off with what's been known to work and has stood the test of time, like Robert's Rules of Order. It’s not the ideal system to prevent all forms of hierarchy, but it’s at least been proven to work in organizing democratic assemblies that are capable of functioning. Why must we reinvent the wheel? The only clear explanation is that it’s fun to fetishize process rather than accomplishing work. There are actually people who've devoted much of their careers as activists to unnecessarily reinventing process, and for years they've been using entire activist communities as guinea pigs in their experiments. Why must we allow ourselves to be pawns in someone else's game? Our goal should be fighting power and injustice, and we should settle for no less than the best tools for the job. But we also shouldn't have to follow Robert's Rules by the book all the time. Oftentimes people will forgo formal process entirely until it's needed. It's also perfectly reasonable to borrow good ideas from other processes. 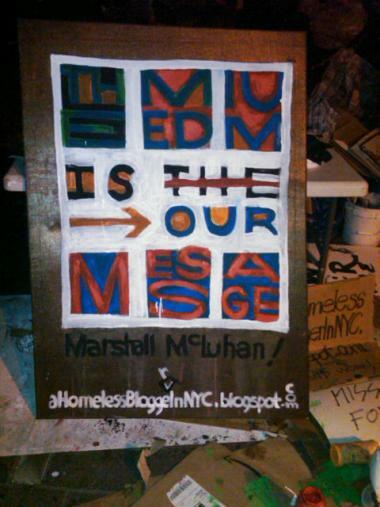 One such example is the "progressive stack" which Occupy has used from its very first general assembly meeting. This means when you have a meeting and ten people want to speak at once, one person will be assigned to "take stack" by writing down the names of whoever has their hand raised. The person taking stack will then prioritize speaking order in favor of people belonging to groups whose voices have traditionally been marginalized. Examples of such groups include women, people of color, and the lgbtq community. This is great news if you're a queer trans woman of color, but not such great news for straight white middle class cis men whose voices have far too often dominated discussion. Another great tool for facilitating collective thought is the temperature check, where everyone in the room twinkles their fingersto express how favorably they feel about the topic of deliberation. But in reality, that’s just a more fabulous variation of Robert’s Rules where the chair will try to gauge support for a proposal during deliberation by asking everyone in the room to say aye / nay or give a show of hands. The only significant experimentation we should be doing with process at this time is trying to find ways to use modern technology to make democracy more democratic. For the first time in the history of civilization, we are able to scale up conversations to span the entire globe. A deliberative assembly no longer must be limited to the number of people capable of fitting in a single room. Why are we not taking advantage of this? Several attempts have been made to develop such systems, but most of the existing solutions are either shoddy, hard to use, or focus on anonymous voting rather than deliberation. These systems also do not make an effort to define the procedural conventions to govern the aspects of software use which cannot be digitized. Engineers, please start teaming up with process experts to accomplish this. To learn more about the follies of consensus, read the essays "Blocking Progress" by Howard Ryan and "Fetishizing Process" by Mark Lance. This article is part of the series To Consense or Not-to-Consense. To read a response to this article, see On Consensus.